My name is Demaskus. I'm a very handsome brown dutch rabbit who was sadly separated from my family they lost their home due to the economy. I know that they miss me, but they thought I might find a family that could take better care of me with the help of PAWS for the San Jose Animal Care Center. I've been neutered and I'm microchipped, too. I'm working on my potty training so I can be your dream bunny rabbit. Andy's Rehoming Center care of PAWS for the San Jose Animal Care Center. A portion of my $80 adoption fee is donated back to the shelter to help the bunnies less fortunate than me. 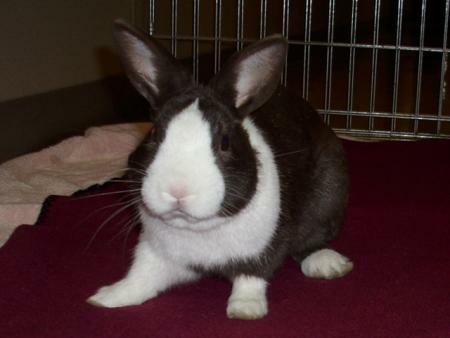 The adoption fee includes a fixed, microchipped rabbits with a free first vet visit. Update 1/2009 - I've been adopted ! My forever home has another sweet little bunny for me to be friends with and my new bunny parents are very bunny savvy so I'm just about the luckiest bunny in the world! Thanks SaveABunny for helping find my family.